*Actual LCE does not match picture. Subtract, like everything. It looks like Peter Molyneux's ability to promise features for his games that never arrive extends in the world of retail box sets as well. 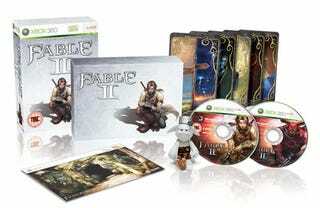 (We kid because we care) Due to a "supply chain issue" the Fable II Limited Collector's Edition will no longer include the premium box, five printed fate cards and Hobbe figure, Lionhead Studios today. To make up for the missing feature set, the collector's edition will now run for about $70, instead of $80. The Collector's Edition is expected to hit on October 21 in North America and Asia and October 24 for Europe and will include:* Fable II game disc * Bonus DVD with new ‘Making-of' Feature * Bonus in-game content (requires Xbox LIVE®) o ‘The Hall of the Dead' Dungeon o ‘The Wreckager' Legendary Cutlass Weapon o Spartan armor and energy sword Lionhead is also giving away a Fable album they created for the game as a free download. The download includes a selection of music from Fable 1 and three brand new tracks from the upcoming Fable II soundtrack. To grab the music go to this link starting on Oct. 6 and enter "FableCollection" as a promotion code.